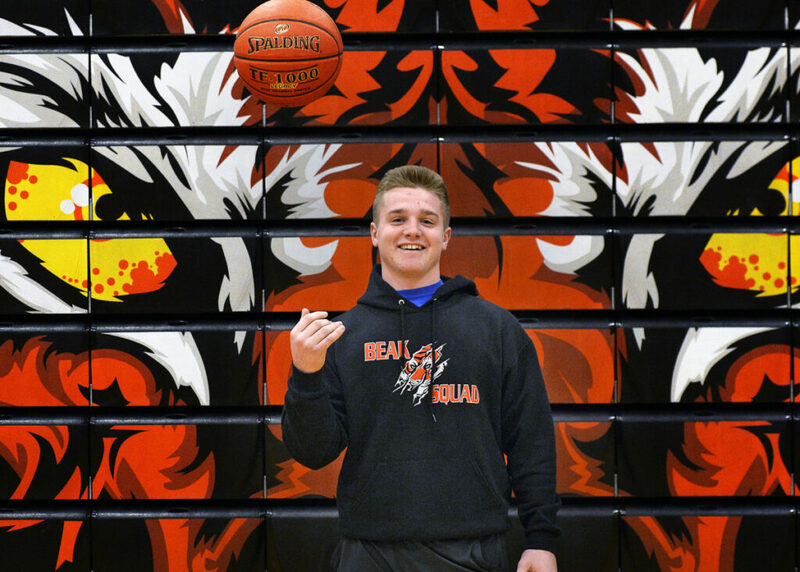 Injured during the football season, Edgerton still found a place on the Tigers boys' basketball team. BIDDEFORD — Kurtis Edgerton is No. 14 on your Biddeford High boys’ basketball roster but he didn’t play a game this year. Edgerton, a junior three-sport athlete for the Tigers, suffered a torn labrum in his right shoulder during the football season and had surgery in late November. He’s hoping to be ready to play baseball in the spring, although it is unlikely he will be able to pitch this year. Q: After your shoulder surgery, why was it important for you to be part of the basketball team? A: It’s a really good group of guys and my brother (senior Carter Edgerton) is also on the team so that motivated me to hang around him. And I really like Coach Tardif, he’s a good guy. And I decided I didn’t want to sit around home doing nothing and do something with myself. So I stuck around with the team. Q: So what do you do with them? A: I mostly just run the scoreboard at practice. I sometime do (video) tape during the games. When I’m not doing tape I’m on the bench getting excited for them, just getting them hyped up. Whatever I can do. Q: And this 84 Feet, how did this come about? A: I didn’t have much to do so Coach Tardif came up with the idea of 84 Feet, which he had done the year before but didn’t follow through with it (last year). So he wanted me to follow through with it, get every teammate done. That was my job for the season, get one or two players each week and have the fans get to know the players. Q: Has it been fun? A: Yeah it’s been fun and I think they enjoy it too. Q: Some of your questions are a little offbeat. A: Yeah, some of them aren’t on basketball, just random questions. Q: Do you prepare in advance or come up with them while you’re walking? A: I prepare them before but (the players) don’t know what questions they’re getting. They have to come up with answers on the spot. Q: So do you think you might want a career in broadcasting? A: I don’t know. Coach said that I’d probably be pretty good on television but I don’t know. Q: You play three sports. Do you have a favorite? A: No. I kind of just like them all the same. Some people think baseball might be the one for me, I don’t know. That’s just the sport that I excel in probably. But I like them all. Q: Your brother has been an important player here for three years in all sports. What’s it been like to follow him? A: Sometimes it’s tough following an act like that. I think we play pretty well together and it’s been fun playing with him in high school. He’s a great role model and he’s a great leader. He gets everything done. Gives his best effort in everything he does. Q: He’s your role model? A: Oh yeah. I hope I can be as good as him. He’s obviously a great player so my goal is always to beat him in anything he does. Q: What do you hope for baseball season? A: I think obviously get better first and see what I can do from there. I think DH maybe. I don’t think pitching is going to be an option. Third base, which was my position last year, isn’t going to be an option either. So I’m thinking DH. Q: You were elected one of the captains of the (2019) football team. What’s that mean to you? A: It means a lot. Again going back to my brother. He was a great leader and I hope to be as great a leader as he was.